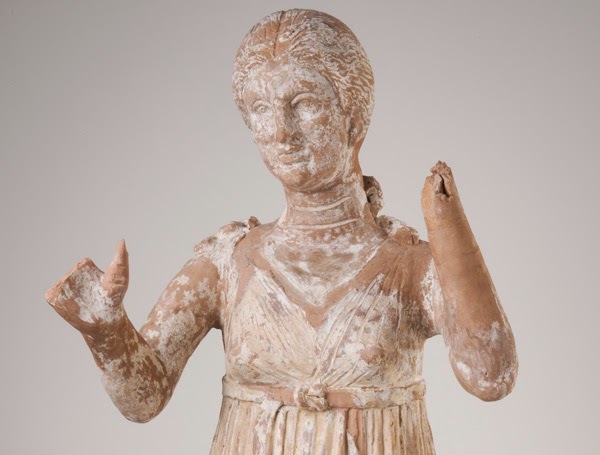 WAM Updates: The Orante statues are back on view by popular demand! The Orante statues are back on view by popular demand! The three ancient statues from South Italy—the focus of WAM’s first Idea Lab—are now installed permanently in the Greek Gallery. On the iPad, read their exciting story that started in underground tombs where they accompanied deceased wealthy citizens along with their precious belongings. Find out how they came to Worcester and what discoveries the conservators made when they restored them in WAM’s conservation lab. KIDS! Check out the activities on the iPad. Try putting a broken statue back together and paint it. Did you know that these statues were painted in bright colors thousands of years ago when they were placed in tombs with the dead?